Today I welcome Louise Lyons to the blog to answer a few questions for Author Interview³. I always loved the stories my mum used to make up for me when I was a little kid and I started making up my own when I was 8 years old. When I was about 12 or 13, we had a writing competition in our English class at school. I wrote something completely different to the recommended subject and I won! When I originally wrote Favourite Toy, I named MC2 Casper. I loved the name and the character so much, when I got a new puppy in October 2016, I named him Casper too. 5) What are your 3 essential writing tools? 6) Where are your 3 favourite places to write? I generally only write sitting on my sofa with my laptop, although in the past I have used a writing desk. My dream writing spot would be when/if I get to move to a place my partner I hope to move to one day, which is in the Lake District, UK. I’d like to be able to have a house where there’s a view of the mountains from the garden, or from a window, and I’d sit there to write so each time I looked up I could see them. Writing a paranormal story is on my wish list. In fact, I have one started with 4 chapters written, but I put it aside a couple of years ago and keep forgetting about it. I intend to try to finish it next year. To write a historic novel, probably set in the wild west. I've written a couple of MF stories set around 1860 - 1870 and I enjoyed writing in that era. I'd like to try my hand at MM in that setting. Another item on my wish list is loosely connected to my writing. I'd like to learn Photoshop, art and design techniques, and try designing my own covers. That one will probably be in the far distant future! 8) What are your top 3 tips for aspiring writers? Read a lot – this advice was given to me when I was starting out and it was an invaluable tip. Reading other people’s work gives you a lot of ideas for what works, what doesn’t, how things sound, your preferred tense and so on. Use a beta reader. They can be amazing for picking up on plot holes you didn’t know were there. Read your story out loud. When I finish a chapter, or the whole book, I read it over out loud. If you have to actually say every word on the page, it highlights errors, wrong words, missing words, sentences that don’t make sense, and repeated phrases. I’m writing the sequel to Favourite Toy which is imaginatively named Favourite Toy 2. I’ve just re-released the original story. Anyone who read Favourite Toy will remember Dean falling for Casper, and Dean’s housemate Ryan, losing the love of his life in a car accident. In the second book, 18 months later Ryan moves on and finds love again with Remy, Casper’s friend. Work on the poor abandoned paranormal story. It’s called The Power of Will and is about a young guy who moves to a new town after a relationship break-up and takes on an old cottage that needs work. Strange things start to happen almost from the first day, and then he finds an ancient journal, written by a young gay man who died almost a century earlier. I want to work on re-releasing my 2015 novel, Beyond the Scars. The publisher it was released with ceased trading and I have the rights back, but I haven’t done anything with it yet. It was one of the works I was most proud of as it was based on experiences in my own life when I was younger. I need to re-work it in a few places, but that’s definitely in the pipeline. 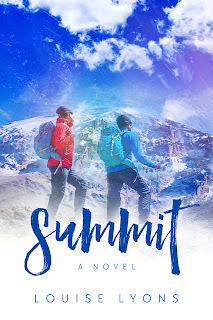 Other than Favourite Toy being re-released on my birthday, 20 October, my one and only 2018 novel Summit was released on 1 September this year. In 2017 I undertook the adventure of a lifetime by climbing Kilimanjaro, the highest free-standing (free of a mountain range) mountain in the world, and when I returned, I put pen to paper (or fingers to keyboard) and began writing a book based on my trek but featuring fictitious characters. My MCs experience exactly what I did—the accommodation, the weather, the food, altitude sickness, and guidance by the mountain leader, doctor, and local Tanzanian team. My MC, Ash, is divorced, not very fit, and not very happy with his life. He’s spent years having the occasional one-nighter with a man, refusing to acknowledge he could be at least bisexual even thought he knows in his heart he is, and could possibly be happy with a man. When he meets Sean on a training trip before going to Kilimanjaro, he begins to fall hook, line, and sinker, and realises he’s going to have to get over his denial or he could lose the best thing to happen to him in a long time. When they spend 10 days together in Tanzania, there's no denying the feelings on either side any more. I am offering 3 eBooks from my backlist in either epub, mobi, or pdf format from the following – Conflicted, Cervena, Beautiful Thunder, Finding Beck, On The Outside, Favourite Toy 2nd Edition. In addition, I have a paperback copy of Beyond The Scars which is no longer available, which will be shipped worldwide, signed, to the winner. To enter, please leave a comment on this post. This competition is being run by the author. All responsibility for choosing a winner and shipping the prize lies with the author, Louise Lyons, and not with this blog. Louise first ventured into writing short stories at the grand old age of eight, mostly about little girls and ponies. She branched into romance in her teens, and MM romance a few years later, but none of her work saw the light of day until she discovered FanFiction in her late twenties. Posting stories based on some of her favourite movies, provoked a surprisingly positive response from readers. This gave Louise the confidence to submit some of her work to publishers, and made her take her writing "hobby" more seriously. Louise has always been a bit of a tomboy, and one of her other great loves are cars and motorcycles. Her car and bike are her pride and job, and she loves to exhibit the car at shows, and take off for long days out on the bike, with no one for company but herself.